James Highcock was born in Rainhill, the seventh child of Samuel and Margaret Highcock. He was baptised by the vicar of St Ann’s, the Reverend John Barton, on 5th March 1875. His father Samuel, a labourer, died in 1903 when James was a young man. The census tells us that James was a coal merchant living in Ritherup Lane, Rainhill with his widowed mother and five adult siblings. On 14th June 1916 at the age of 39, James was conscripted for military service. At this time, he was still living in Ritherup Lane. He was posted to the 3rd (Special Reserve) Battalion of the South Lancashire Regiment. After four months of training, James went to France with his unit. He was later transferred to the 7th Battalion of the Prince of Wales Volunteer’s Lancashire Regiment as Private 22551 on 5th November 1916. Within a month of arriving in France, James was wounded. He re-joined his unit at the beginning of 1917. Nine months later he was again wounded in fighting close to Ypres. His injuries were caused by gunshot wounds. His wounds were dressed in a Field Ambulance before he was evacuated back to a hospital in Southampton early in October 1917. Septicaemia set in and the hospital advised the Army Records Office that he was dangerously ill. On 19th October, just a year after arriving in France, James died from his wounds. His body was returned to Rainhill and he was buried in St Ann’s churchyard on 25th October 1917. He was 41 years old. In April 1918, six months after his death and seven months before the war ended, his possessions were returned to his family. A cardigan, a flannel shirt, a cotton bag, scissors, a wooden pipe and tobacco, a canvas belt, a pocket knife, a telegram, some correspondence and an unopened letter. His older brother and mother died the following year and are buried in the family grave. The body of James Highcock was returned to Rainhill and he was buried in the family grave in St. Ann's Churchyard. ​The first part of the inscription on the gravestone reads. 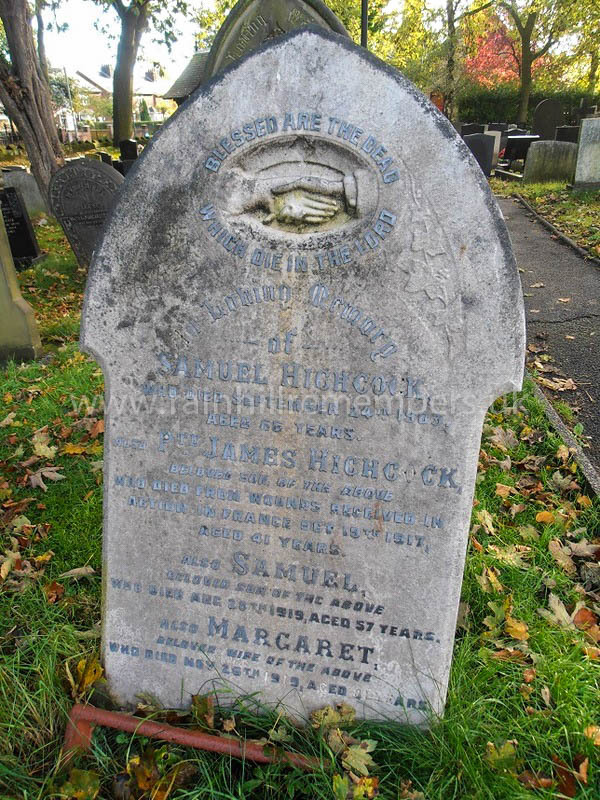 ‘In loving memory of Samuel Highcock who died September 24 1903, aged 66 years. Also, Private James Highcock beloved son of the above who died from wounds received in action in France October 19 1917 aged 41 years’. Medal entitlement :- Victory medal and British War medal.